This recipe puts an Oriental twist on the most American dessert, but it is still delicious! Beat 6 oz (1 1/2) sticks of butter with the 2 Tbsp of sugar and the salt until smooth at room temperature. Add 2 cups of flour and mix until butter is worked in and mix is powdery with small lumps. Refrigerate. Toss apples and lemon juice in large bowl. Melt 1/2 stick of butter in large pot over medium heat. 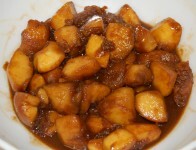 Add apples and brown sugar; cook until apples are tender (about 15 minutes). Return apples to same bowl with a slotted spoon. Boil juices in pot until thick, about 15 minutes. Pour juices over apples. Cool, mix in 2 Tbsp flour and five-spice powder. Remove refrigerated flour/butter mixture. Add 6 Tbsp of cold water while stirring. Dough will look lumpy. Separate in half. Knead each half into a ball quickly. Avoid getting the dough warm. Roll out the dough on a lightly floured surface. Transfer to 9-inch pie pan. Spoon apples into crust. Roll out top crust, cover pie. 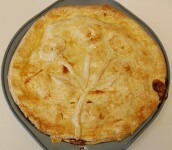 Crimp edge with fork and trim, make small cuts to let steam escape, brush top crust with beaten egg. Place pie on baking sheet in rack in lower third of the oven preheated to 375 Degrees Fahrenheit. Bake until crust is golden brown, about 1 hour. Transfer to cooling rack.